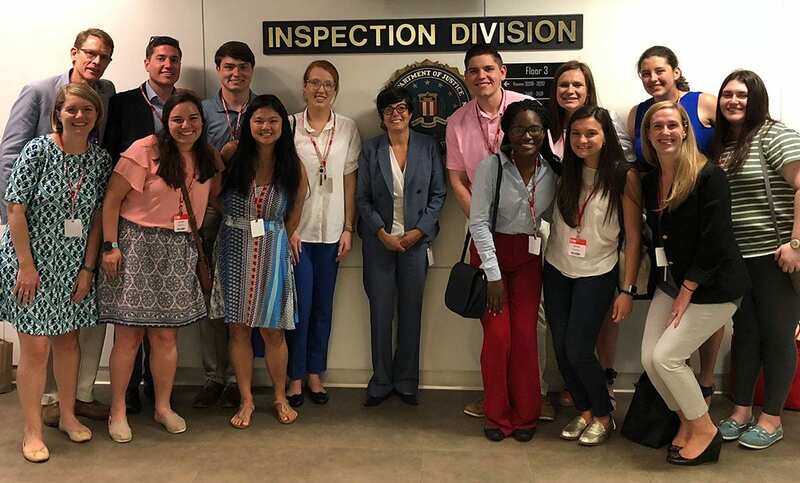 Students in the Leadership Fellows Program and representatives from Providence College are welcomed to the J. Edgar Hoover building by Nancy McNamara ’84, center, assistant director in charge of the FBI’s Washington, D.C., field office. 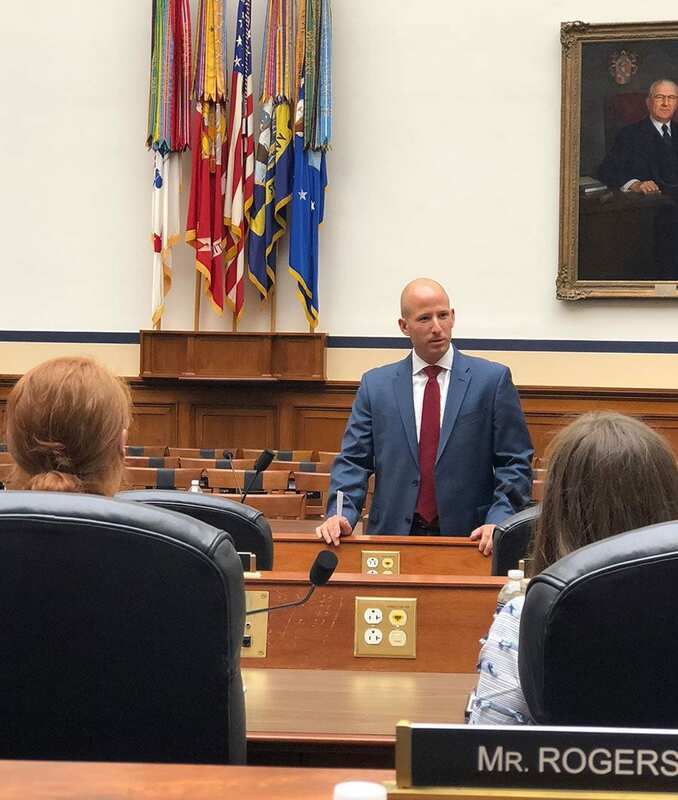 From one of the highest-ranking officials in the FBI to CEOs, COOs, presidents, and executive vice presidents, 10 Providence College students absorbed lessons in leadership from alumni executives for three days in Washington, D.C. The opportunity came about during “PC in DC,” developed and offered for the first time by the College’s Leadership Fellows Program. 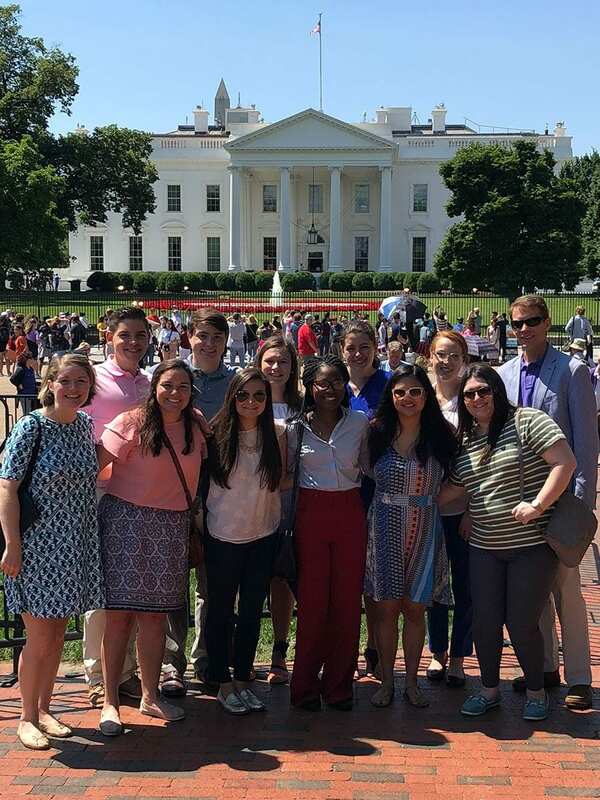 Students from a mix of academic disciplines took behind-the-scenes tours, had in-depth dialogue with top alumni administrators in government and private business, and were hosted at a Washington Nationals baseball game in a packed morning-to-late night itinerary. The primary objectives of the experience were to expand students’ views of effective leadership and to have each fellow come away with at least one new alumni business contact in the nation’s capital, where there is a large population of PC graduates. In the views of organizers and students, those goals were achieved. Major Michael Calcagni ’04, a legislative liaison with the U.S. House of Representatives, speaks to fellows in a House meeting room. “The contact and conversations with the alumni were great. The students could ask questions you wouldn’t be able to ask in a lecture hall. I think we were all very pleased,” said Leslie Heller ’02, director of the Center for Orientation, Transitions, and Leadership, and co-director of the Leadership Fellows Program. Heller was joined in Washington by one of the program’s other directors, Dr. Matthew Eriksen, professor of management. The third director is Patricia A. Goff ’08G, assistant vice president for integrated learning and administration. A collaborative effort between the Division of Student Affairs and the PC School of Business, the Leadership Fellows Program is a non-credit, co-curricular program aimed at helping students become authentic, effective, and ethical leaders. It is offered for three semesters to students, beginning in their sophomore or junior year. Program highlights include general meetings involving the student cohort, faculty, and staff, and attendance at the annual Rhode Island Conference on Values-Based Leadership. The idea to establish an activity involving students and alumni executives came about as a result of the LFP directors’ goal to extend the fellows’ experience off-campus, said Heller. Staff members in the Office of Institutional Advancement, including Paul Calle ’12 & ’15G, major gifts officer, and Brittany McHale Donahue ’11, assistant director for alumni relations, were instrumental in identifying alumni executives in D.C. and coordinating other aspects of PC in DC. Eleven alumni participated in the program, which included the annual Alumni-Student Networking Night presented by the PC Capital Area Alumni Club. In addition to the networking night, PC in DC highlights included: an interactive tour of FBI headquarters and a presentation from Nancy McNamara ’84, assistant director in charge of the Washington Field Office; an opportunity to collaborate as a focus group on a test product being considered by Surprise Ride, an educational activities business co-founded by COO Rosy Khalife ’13; a tour of the U.S. Capitol led by U.S. Army Major Michael Calcagni ’04, a legislative liaison with the U.S. House of Representatives, and Nicholas Mikula ’11, deputy communications director and professional staff member at the House Committee on Armed Services; and a behind-the-scenes tour of Reagan National Airport with Margaret E. McKeough ’83, executive vice president and COO of the Metropolitan Washington Airports Authority and the authority’s second-in-command administrator. 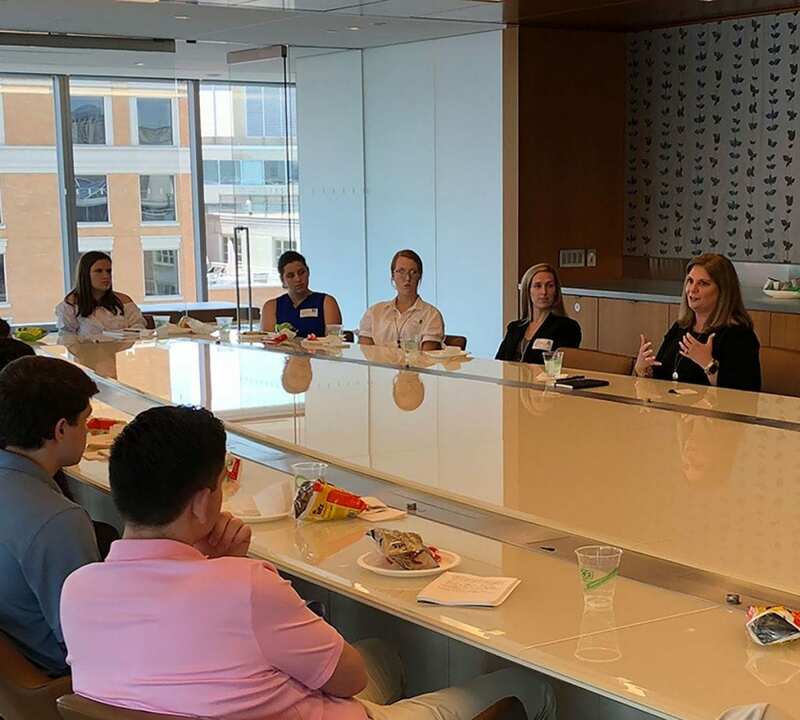 Beth A. Viola ’90, senior policy advisor with Holland & Knight, a strategic communications agency, right, hosts a luncheon meeting with leadership fellows. Fellows said the three-day program sharply impacted their views of leadership. One, Meredith Daigle ’20 (Belle Rose, La. ), a political science major and a theology minor, said PC in DC changed her understanding of the concept of leadership. “Leadership doesn’t just end with your work day; it continues throughout your professional and personal life,” said Daigle, who is co-president of the History Club and a member of the Student Advisory Council, Admission Ambassadors, and the Hunger and Poverty Awareness Committee. She said fellows asked alumni not just about their jobs, but what they do out of the workplace. One alum, Stephen J. Caldeira ’81, president and CEO of the Household & Commercial Products Association, recently was named chair of the National Capital Area Chapter of the Alzheimer’s Association, noted Daigle. “Leadership is something that extends into all aspects of life,” she said. Daigle added that meeting Khalife and hearing her story was another trip highlight. Khalife began working to start Surprise Ride while she was a student at PC and took on extensive responsibility because she loved and believed in what she was doing. Another fellow, Morgan Starkey ’20 (Sandy Spring, Md. ), said the interaction with alumni made her realize leadership is much more than conveying one’s own ideas and thoughts. The PC in DC group stops briefly outside the White House. The group includes two of the co-directors of the Leadership Program, Leslie Heller ’02, front left, and Dr. Matthew Eriksen, rear right. Students are, front row from left, Meredith Daigle ’20, Devon Guanci ’19, Phoebee Jean ’19, Lianne Bisch ’19, and Julia Vaccarella ‘20, and rear, Thomas McCormack ’20, Dylan Black ’20, Emily Kennedy ’19, Morgan Starkey ’20, and McKenzie Campbell ’20. Starkey said she was most inspired by McNamara’s story of vision and persistence in joining and ascending the ranks of the FBI. At one time, before being hired as a special agent in 1996, McNamara worked for Macy’s. “Ever since she was young, Ms. McNamara wanted to become an FBI agent. Although she wasn’t immediately selected to be a part of the FBI, she remained determined to follow her dream. By working hard and believing in herself, Ms. McNamara has been able to rise in the ranks of the FBI,” said Starkey, who also is an Admission Ambassador and whose other extra-curricular interests include serving as an orientation leader, as a Special Olympics volunteer, and with the Peer Ministry Program of Campus Ministry. Caldeira, who is a member of PC’s National Board of Overseers, eagerly accepted the offer to meet with the students. He said, as an undergraduate, the College gave him “a moral compass to give back and pay it forward,” and added that he hoped sharing his work experiences could benefit the fellows in a tangible way. “No matter what professional vertical they choose to pursue, at some point in time they will see the need to have a mentor, someone they respect, can rely on, and learn from … they should embrace that, and then do the same for others, as that is what Friars do,” said Caldeira. The LFP directors and other organizers of PC in DC were pleased by the fellows’ engagement during the program and the responses they received from the students after, and they are hopeful the program will be offered again. Heller said one student who is considering law as a career expressed interest in returning to Washington for post-graduate education. Others indicated they would definitely be interested in working there after graduation. “Their eyes were opened by this experience,” said Heller. PC in DC was made possible by the generosity of many alumni in the area, including lead benefactor and former PC trustee Jack Mahoney ’65. The LFP, now in its sixth year, has benefitted from the support of Lisa DelPriore Hannan ’85, a member of the College’s National Board of Overseers and of the National Alumni Association Council. Alumni participants in PC in DC were U.S. Army Major Michael R. Calcagni ’04, legislative liaison, U.S. House of Representatives; Stephen J. Caldeira ’81, president and CEO, Household & Commercial Products Association; Sarah A. Flanagan ’79, vice president/government relations and policy development, National Association of Independent Colleges and Universities; Rosy Khalife ’13, co-founder and COO, Surprise Ride; Curtis LeGeyt ’00, executive vice president/government relations, National Association of Broadcasters; David Leiter ’76, president, Plurus Strategies; Margaret E. McKeough ’83, executive vice president and COO, Metropolitan Washington Airports Authority; Nancy McNamara ’84, assistant director, FBI, in charge of the Washington Field Office; Nicholas Mikula ’11, deputy communications director and professional staff member, House Committee on Armed Services; David Sylvia ’90, senior director/government affairs outreach & programs, Altria; and Beth A. Viola ’90, senior policy advisor, Holland & Knight.